After the big #dressgate a few weeks back, I got to thinking about perceptions and a favorite old social language concept: perspective taking. What is perspective taking? In Michelle Garcia Winner’s Social Thinking terms, perspective taking is when you have a thought about another person (“I can’t believe she thinks that dress is white and gold!”) and then realize that others have thoughts about us too (“She is crazy if she thinks that dress is black and blue!”). To further think of this concept we must be able to understand how others perceive things and realize that our opinions are not always the opinions of others but that we are always formulating thoughts about those around us whether we realize it or not. Was the dress black and blue or white and gold? Does it really matter? Are we so freaked out by the reality that others can see something differently than we can? And actually in this case, science can explain a lot to us. This isn’t a new concept, however. 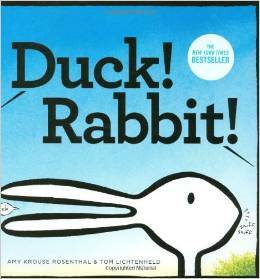 Take one of my favorite books: Duck, Rabbit! Do you see a duck? Or maybe it’s a rabbit. But does it matter? The point is that we are able to defend our choices, explain them, and accept that others may not always agree with us. You have a thought and I have a thought – it’s what we do with those thoughts that enables us to form and maintain relationships with others. Often, our kids cannot understand this concept. They usually think because they like Minecraft or learning about black holes that others must like the same. We all find joy in a variety of topics, no matter who we are. And this is the concept I work on with my kids. If you can defend your opinions and accept the concept of agreeing to disagree, then I certainly feel successful. Furthermore, if you can realize that you are not the only one with thoughts (and that others will be perceiving you a certain way based on what you say or do) then we are definitely making progress. Black and blue, white and gold, duck or rabbit. I can see the argument for any. Let’s work on acceptance of the argument and explaining what YOU think. We could all use a little flexible thinking.